The Create Space Time Cube By Aggregating Points and Create Space Time Cube From Defined Locations tools structure and summarize datasets into a netCDF data format by creating space-time bins that form what can be thought of as a cube. 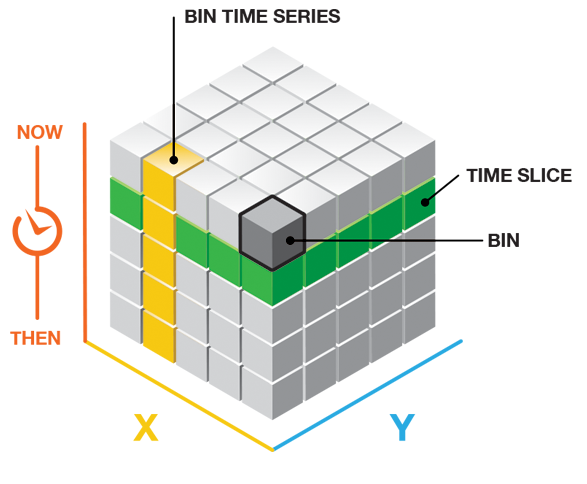 Each bin within the cube contains a count of the number of events that occurred at the bin location for the time-step interval specified. Additionally, the cube may contain one or more Summary Fields or Variables with statistics for those fields in each bin. The Emerging Hot Spot Analysis tool takes the netCDF cube as input, runs a space-time hot spot analysis, and identifies trends in the aggregated count data, summary fields or variables, such as new, intensifying, diminishing, and sporadic hot and cold spots. The Local Outlier Analysis tool also takes the netCDF cube as input and runs an interpretation of the Local Moran's I statistic to identify statistically significant clusters and outliers in the context of both space and time. The netCDF cube is updated with the results of these analyses in the form of several new variables. These tools are available in the Space Time Pattern Mining toolbox. It can help you understand the structure of the space-time cube and how the process of aggregation into the cube works. It can also offer insights into the results of Emerging Hot Spot Analysis and Local Outlier Analysis, providing evidence that can help you understand the result categories themselves. Additionally, visualizing Summary Fields and Variables can help you understand how confident you can be in subsequent analyses by displaying the spatial pattern of empty bins that had to be estimated. Open a scene. 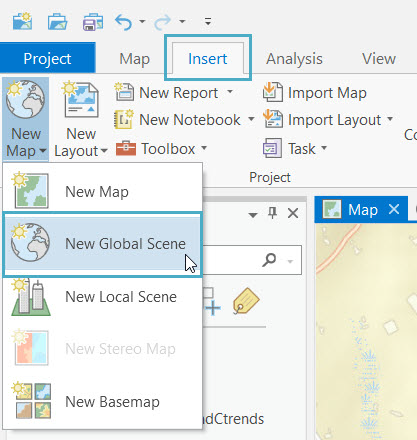 To open a scene so the results of the tool can be rendered in 3D, go to the Insert tab, click New Map, and choose a new scene. Set the elevation surface to zero. Because time is used as the vertical axis in visualizing the space-time cube, it is important for accurate interpretation that all locations on the ground are at the same elevation. This way, all time-step intervals start at the same base. To do this, the default elevation services need to be shut off. To turn off elevation services, right-click the new Scene in the Contents pane and click Properties. Browse to the Elevation Surface tab, expand Ground, and remove the elevation services that are being used by default. Open the Visualize Space Time Cube in 3D tool. Choose a Cube Variable to explore. After Create Space Time Cube By Aggregating Points or Create Space Time Cube From Defined Locations has been run, variables stored in the cube will include Count as well as any Summary Fields or Variables that you chose to aggregate when creating the cube. Choose a Display Theme for the Cube Variable chosen. The Value option allows you to see the raw numbers associated with aggregation. You also have the option of visualizing Hot and cold spot results if you have run Emerging Hot Spot Analysis and Cluster and outlier results if you have run Local Outlier Analysis on that particular variable. Summary variables also give you the option to display the Estimated bins so you can see exactly which bins were filled in based on your decisions when you created the cube. Choose where to save the Output Features and click Run. See Visualize temporal data using the time slider to learn more about enabling time on your 3D space-time cube and exploring the temporal aspects of your data. See Get started with the range slider to learn about different ways to explore numeric data stored in the space-time cube. 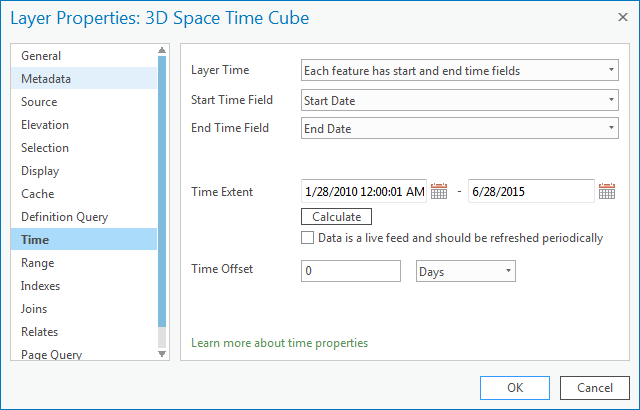 In the Contents pane, double-click the output of the Visualize Space Time Cube in 3D tool and choose Time. Set Layer Time to Each feature has start and end time fields. Start Time Field and End Time Field automatically populate, and Time Extent is automatically calculated. Click OK.
Click the Time tab and set Span to 0. Uncheck the Use Time Span check box and set Step Interval to the Time Step Interval of the Input Space Time Cube. Enable time by clicking the time button to the left of the time slider and use the arrows or play button to explore the results in your space-time cube. The Space Time Cube Explorer Add-in was developed to enhance the way you interact with and explore your space-time cubes by automatically setting up time and range sliders for you. The Explorer also allows you to display your cubes quickly and beautifully with many pre-set layer symbology options in the Display Gallery. The Space Time Cube Explorer Add-in is available at www.esriurl.com/SpaceTimeCubeExplorer. Your 3D visualization of the space-time cube can also be shared as a web scene and used in story maps. Open the Visualize Space Time Cube in 2D tool. Choose a Cube Variable to explore. After the cube has been created, variables stored in the cube include Count, as well as any Summary Fields or Variables that you chose to aggregate when creating the cube. Choose a Display Theme to display the chosen Cube Variable. Locations with data—Allows you to see all of the locations that contain data for the chosen variable, and the Trends option shows where values have been increasing or decreasing over time (the results of the Mann-Kendall statistic run on the chosen Cube Variable for each location). Both Locations with data and Trends are always available. Hot and cold spot trends—Shows where hot and cold spot z-scores are increasing or decreasing over time (the results of the Mann-Kendall statistic run on the z-scores of the space time hot spot analysis for the chosen Cube Variable), and Emerging Hot Spot Analysis results re-creates the results you saw when you ran the Emerging Hot Spot Analysis tool. Both Hot and cold spot trends and Emerging Hot Spot Analysis results are only available when Emerging Hot Spot Analysis has been run on the chosen Cube Variable. Local Outlier Results—Re-creates the results you saw when you ran the Local Outlier Analysis tool for the chosen Cube Variable. Number of estimated bins—Shows how many bins were estimated at each unique location, allowing you to see if there is a spatial pattern of places with missing values. If entire sections of the map have high numbers of estimated bins, those areas may be best left out of the analysis. Locations excluded from analysis shows those places that had data but had empty bins that could not be filled because they did not meet the criteria for estimation. Both Number of estimated bins and Locations excluded from analysis are only available for Summary Fields.